1937 – The Irish Free State is replaced by a new state called Ireland with the adoption of a new constitution. A lot of people in the UK don’t seem to have realised this yet. Apparently the same can be said of the American President. It makes Irish people quite angry. 1940 – World War II: In the Second Great Fire of London, the Luftwaffe fire-bombs London, England, killing almost 200 civilians. 1997 – Hong Kong begins to kill all the city’s 1.25 million chickens to stop the spread of a potentially deadly influenza strain. 2003 – The last known speaker of Akkala Sami dies, rendering the language extinct. Actually Wikipedia seems at odds with itself over whether there are still two speakers alive, however it notes that the language is poorly documented and its demise is imminent. This is where it was spoken in Russia. It always makes me sad when languages die. 2011 – Samoa and Tokelau skip straight to December 31 when moving from one side of the International Date Line to another, losing two days. 1970 – Glen Phillips, American singer-songwriter and guitarist (Toad the Wet Sprocket). The band name is taken from Monty Python. In Dobrzyn today, Hili has an important question. I’ve always been grateful that humans have hands and washcloths. And soap. 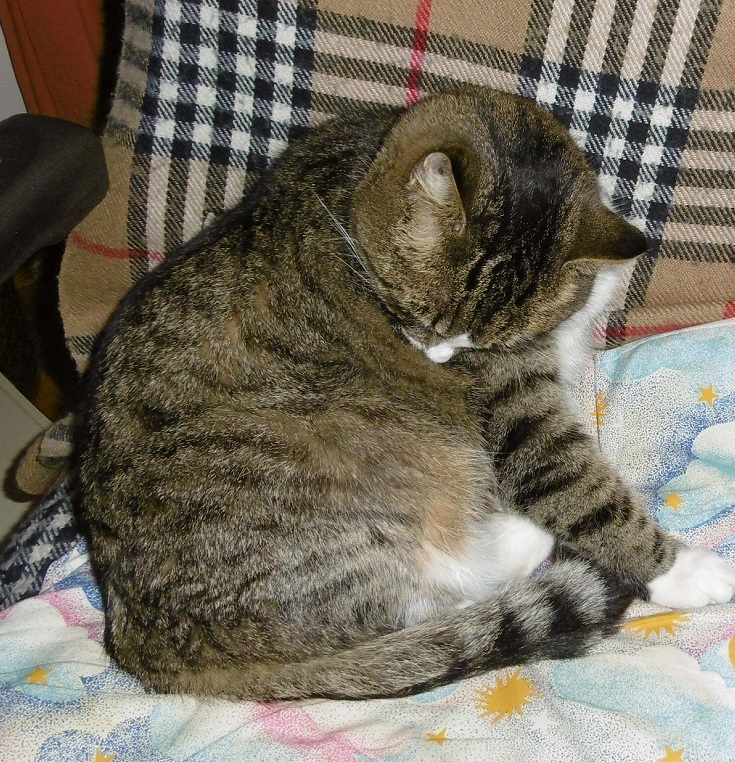 Hili: Do you groom yourselves as I do? A: But we spend a bit less time on it. Hili: Czy wy dbacie o siebie tak jak ja? Ja: Na pewno poświęcamy temu trochę mniej czasu. This is a bad teacher, guilty of playing the Guess What I’m Thinking game. Both of these are equally effective anyway. Don’t @ me. 😍😍Like being on a merry-go-round… Tiny leatherjacket shelter inside a Haekels jellyfish. . This entry was written by whyevolutionistrue and posted on December 29, 2018 at 7:00 am and filed under Hili Dialogue. Bookmark the permalink. Follow any comments here with the RSS feed for this post. Both comments and trackbacks are currently closed. Awww, I was expecting the passenger to meet her (?) friends (??) on the tow-quad as they reversed back to the starting point. I was terribly disappointed. There seems to be an issue with the projectile getting stuck in the pocket and not getting a clean release. Must have bought it from Acme. Looks very fun though. If they could maybe make it a bit more professional and not so much like an entrant to the Darwin Awards I’d consider having a go. A very small deviation in the angle of release would drive the cargo into the ground. I think the anchor points are high enough and the angle of the bungee on launch sufficiently high that she’s safe. In fact I think that if the vertical components of force in the bungee cord are sufficient to hold her off the ground in the initial position (which they obviously are) then those will still apply when she’s been pulled out to one side. (In fact they’ll be slightly greater since she’s been pulled downwards a bit by the angle of the tow). What I’m not sure of is whether she might get pulled too high at some point in her trajectory so she strikes the ground on the rebound, so to speak. I’d be more worried about the condition of the bungee cord, though. Or the supports. Is it me or is that math question confusing. I think I would get it wrong too lol. I didn’t understand it either. What does ‘the remaining quarter’ mean? Sloppy wording on tests. It always led to feuds with my mentors. There are 8 left. So when she asks for the remaining quarter I guess she is asking for 2 more out of 8? There are 12 left – it started with 16. So 3 more. I took it as a quarter of 16, so 4. But it’s extremely badly worded, no one ‘solution’ seems any more likely than any other. 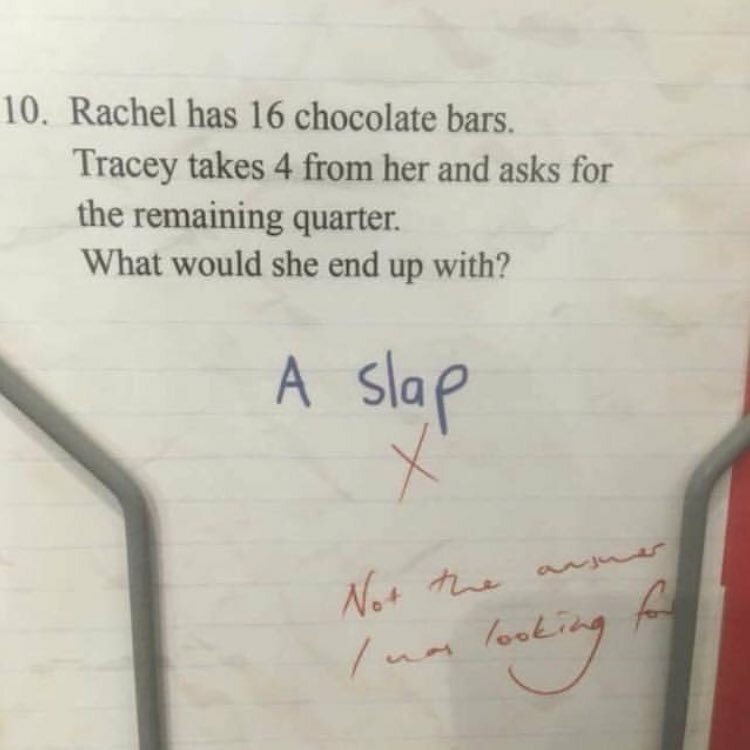 I think ‘a slap’ is actually the answer that makes most sense. It’s even worse (more ambiguous) than I thought. Five apples and a dead neighbor. I’d slap the writer of the math question. It confusingly uses “the” instead of “a”. The phrase should have been “a quarter of what remained.” This also removes the possibly ambiguous term “remainder.” But these days I suppose it is too much to ask for a math test writer with accurate-writing skills. That math question reminds me of a couple of the more memorable answers I got from little kids when doing testing assessments. Me: Please put the block under your chair. Me: If your father is a man, your mother is a…? Kid: (son of a med student) She’s going to be a doctor, but right now she’s not anything. A friend of mine when she was a kid was asked what she wanted to be when she grew up and, wide-eyed and wistful, said she wanted to be “a duck”. Did some nerd take over North Korea’s twitter account? It’s a parody account that has managed to take in several news agencies over the years. Ultima Thule turns out to be a close binary system. So there are two objects that we will see soon. I am also saddened when languages die. Finally! Condoms that meet papal quality standards! In the Catholic community of my youth, there were just two Church-approved methods of contraception: the rhythm method and coitus interruptus — or, as they were known among Catholic wags, Rhythm & Blues. this day in Catalonia in 1876. He died in 1973.